BEST is expanding its horizons and went to the UK to meet with two new partners that are based in the UK and the USA. These are global SAP Silver Partner, G3G, which is part of the groupelephant.com group along with renowned SAP Consultancy EPI-USE. Both parties are interested in representing all the BEST Modules: Automated Supplier Recons, General Ledger Recons & General Ledger Clearing. A strong focus was placed on the new General Ledger Modules that automate the balance sheet reconciliation process in SAP. The function was over 2 days with employees and clients being allowed to browse the various Solution Pods and Exhibitors at Mercedes Benz World in Weybridge. Over the break periods you could watch the cars race around a skid track, a normal track and wander through the Museum. Henry Curtis, Solution Architect from BEST presented the BEST Modules in SAP over 2 periods and showed how the balance sheet reconciliations procedure in SAP can be fully automated using the BEST GL Clearing and BEST GL Recon Modules. 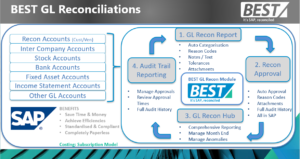 He discussed balance sheet reconciliation best practices and how standardisation across your organisation can not only reduce time spent on your month end but can also greatly enhance your reconciliation process controls framework. In the diagram below, you can see how BEST enables you to improve, monitor and control your entire month end reconciliation process – all within SAP. This allows for a quicker month end close, increased coverage, significant cost savings – and all completely paperless!